— See also Texas Archival Resources Online, Archiving the Central American Revolutions Micro Oral History Collection. G. Highlighted the benefits of the Sandinista reform program for the masses, although this was a controversial issue among activists, with liberals focusing on non-intervention (and avoiding the issue of the character of the Sandinista government and programs) and solidarity activists as well as long-term missionaries in Nicaragua attesting to the benefits of Sandinista social welfare programs. All articles in the New York Times are available online. For Washington Post articles, access to a search engine such as ProQuest is needed, available through most libraries. Media coverage of the Central America movement was not extensive, on the whole. The dispersed nature of the movement meant that there was no central spokesperson or group to which the media could readily turn for information. Religious leaders and missionaries rated high on the media’s radar, followed in rough order by political leaders, veterans, union leaders, film stars, liberal lobby groups, peace activists, and leftist groups. There were occasional profiles of local groups and activists (see, for example, Patricia Squires, “Aiding Contras Opposed,” New York Times, March 16, 1986). In terms of activities, what interested the media most was the political debate in Washington, which pitted liberal Democrats against the Republican administration, and the efforts by interest groups, pro and con, to influence members of Congress. Demonstrations, vigils, fasts, and civil disobedience actions (arrests) were duly covered, although the media tended to focus more on the action than the message. Transnational activities (study tours, sister cities, humanitarian aid projects, work brigades, and Witness for Peace delegations) provided another angle of interest, as activists and local communities engaged in their own “citizen diplomacy.” Occasional kidnappings by the Nicaraguan contras and the death of Ben Linder caught the media’s attention. A fourth theme was the FBI’s spying and harassment of Central America activists, particularly CISPES, and the response of Congress. The Sanctuary Movement’s activities supplied a fifth theme and attempts by U.S. veterans to deliver humanitarian aid to Nicaragua offered another unique angle. Valente, Judith. “D.C.-Area Hispanics Collect Funds to Spread Revolutionary Information.” Washington Post, Feb. 25, 1980, A20. De Onis, Juan. “Catholic Bishops Ask End of Arms Aid to El Salvador.” New York Times, Nov. 9, 1980, 15. “Bodies of 4 American Women Are Found Slain in El Salvador.” New York Times. Dec. 5, 1980, A3.Phelps, Timothy. “For Two Nuns, Needs of Poor Hid the Danger.” New York Times. Dec. 7, 1980, 9. Bonner, Raymond. “Protests on Salvador Are Staged across U.S.” New York Times, March 25, 1981, A3. “Congress Mail Heavy on El Salvador Issue: Legislators Receiving Hundreds of Dollars a Week Opposing U.S. Dispatch of Military Help.” New York Times, March 26, 1981, 7. Timothy Phelps, “U.S. Role in El Salvador Protested.” New York Times, April 19, 1981, 26. “80 Arrested in Protest at White House.” New York Times, July 4, 1981, 7. Crossette, Barbara. “Groups Trying to Sway Latin America Policy.” New York Times, Nov. 18, 1981, A24. “Rally at Fort Benning Deplores the Training of Salvadoran Troops.” New York Times, Jan 25, 1982, A4. Briggs, Kenneth. “U.S, Catholic Bishops Opposing Administration’s Salvador Policy.” New York Times, Feb. 21, 1982, A1. Asner, Edward. “We’re on the Wrong Side in El Salvador” (opinion). New York Times, Feb. 20, 1982, 23. “Salvador Policy Protest is Staged in New York.” New York Times, Feb. 21, 1982, A21. Harmetz, Aljean. “Screen Actors Panel Stands By Asner.” New York Times, Feb. 26, 1982, C11. Taubman, Philip. “Salvadorans’ U.S. Campaign: Selling of Revolution.” New York Times, Feb. 26, 1982, A10. “Dear Citizen: Listen to today’s reports from El Salvador: They’re eerily reminiscent of Vietnam 15 years ago” (advertisement sponsored by the ad-hoc Committee to End U.S. Intervention). New York Times, Feb. 28, 1982, E20. Roberts, Steven. “A Majority in Poll Want U.S. to Stay out of Salvador War.” New York Times, March 2, 1982, 1. Shaw, Terri. “Mimeographs Roar in Propaganda War.” Washington Post, March 7, 1982, A1. Fitch, Stona. “El Salvador Dispels Apathy at Princeton.” New York Times, March 16, 1982, sec. 11, p. 16. Murphy, Caryle. “Critics of U.S. Policy in El Salvador to Rally.” Washington Post, March 27, 1982, A22. Suplee, Curt. “Protest From The Poets.” Washington Post, June 15, 1982, B11. Austin, Charles. “300 Church Leaders Protest U.S. Policies in Central America. New York Times, Nov. 28, 1982. Mintz, John. “126 Arrested at State in Protest Of El Salvador Rights Finding.” Washington Post, Jan 25, 1983, B1. Weinraub, Bernard. “U.S. Catholic Conference Asks Shift on El Salvador.” New York Times, March 8, 1983, 7. Mohr, Charles. “Reagan Receives Bishops’ Protest.” New York Times, March 10, 1983, A7. Weinraub, Bernard. “U.S. Is Condemned over Salvadorans: Refusal to Grant Them Asylum Stirs Protest in Congress and by Church Groups.” New York Times, March 21, 1983, 5. Herbut, Paula. “Four Salvadorans Fast To Protest U.S. Policy.” Washington Post, March 26, 1983, B3. Volsky, George. “U.S. Churches Offer Sanctuary to Aliens Facing Deportation.” New York Times, April 8, 1983, 1. “No Vietnam war in Central America!” (advertisement promoting a demonstration in Washington, DC, on July 2). New York Times, May 1, 1983, E3. Peri, Peter, and Caryle Murphy. “Opposing Groups Air Latin America Views at Vietnam Memorial.” Washington Post, July 3, 1983, A1. Hyer, Majorie. U.S. Policy on Central America Opposed by Mainline Christians. Washington Post, July 3, 1983, A2. Austin, Charles. “L.I. Bishop Asks the End of Salvador Aid.” New York Times, July 19, 1983, 2. Gruson, Lindsey. “Poll Reveals Fear of El Salvador as a New Vietnam.” New York Times, July 24, 1983, 15. Drozdiak, William. “Europe Concerned Over Central America’s Impact on Alliance,” Washington Post, Aug. 10, 1983, A16. Shipp, E. R. “3 in Hunger Strike over Salvadorans at U.S. Base.” New York Times, Aug. 16, 1983, 9. Austin, Charles. “More Churches Join in Offering Sanctuary for Latin Refugees.” New York Times, Sept. 21, 1983. 18. “If President Reagan Can Get Away with the Invasion of Grenada, What Next?” (advertisement announcing a march on Washington November 12). New York Times, Nov. 6, 1983, E22. Murphy, Caryle. “20,000 Protest Against U.S. Policy.” Washington Post, Nov. 13, 1983, B1. “Vietnam? Artists Call Against U.S. Intervention in Central America” (advertisement). New York Times, Jan. 22, 1984, E6. “U.S. Volunteers Help Nicaragua with the Harvest.” New York Times, Feb. 16, 1984, A4. Omang, Joanne. “Catholic Groups Differ With Pope Over Nicaragua.” Washington Post, July 23, 1984, A1. Omang, Joanne. “Pacifists Plan Protest if U.S. Attacks Nicaragua.” Washington Post, July 26, 1984, A10. Omang, Joanne. “Inquiry Finds Atrocities By Nicaraguan ‘Contras’.” Washington Post, March 7, 1985, A14. Rohter, Larry. “Nicaragua Rebels Accused of Abuses: Private Group Reports Pattern of Attacks and Atrocities.” New York Times, March 7, 1985, A1. Baker, Donald P. “A Long Road to Sanctuary.” Washington Post, March 25, 1985, B1. Burnham, David. “F.B.I. Questions Visitors to Nicaragua.” New York Times, April 18, 1985, A3. Burnham, David. “Foes of Reagan Latin Policies Fear They’re under Surveillance.” New York Times, April 19, 1985, sec. 2, p. 20. Engelberg, Stephen. “Thousands Join Protest in Washington.” New York Times, April 21, 1985, 22. “Latin America Policies Are Protested in U.S.” New York Times, May 8, 1985, A16. “San Francisco Harbor ‘Mined’ by Protesters.” New York Times, May 31, 1985, A17. “Group Sought to Deter Rebel Attacks.” New York Times, Aug. 8, 1985, A8. Kinzer, Stephen. “29 U.S. Activists Reportedly Freed in Nicaragua.” New York Times, Aug. 9, 1985, 8. Kinzer, Steven. “Freed U.S. Activists in Nicaragua Town.” New York Times, Aug. 10, 1985, 3. “Clergymen Assert Abduction Wasn’t Staged.” New York Times, Aug. 15, 1985, A3. Shaw, Terri. “Americans to Testify Against U.S. in Nicaraguan World Court Case.” Washington Post, Sept. 8, 1985, A17. Matthews, Jay. “On Trial in Tucson: Law vs. Conscience.” Washington Post, Oct. 25, 1985, A4. “Serrin, William. “Labor Resolution Criticizes U.S. Role in Central America.” New York Times, Oct. 30, 1985, B6. Kinzer, Stephen. “Contras’ Attacks on Civilians Cited.” New York Times, Feb. 20, 1986, A7. “Contra Atrocities” (advertisement for a Witness for Peace film showing in New York City). New York Times, Feb. 28, 1986, B4. “Religious Figures Protest Contra Aid.” New York Times, March 5, 1986, A4. Apple, R.W. “Mudslinging Over Contras: Aid Issue’s Subtleties Get Buried in Epithets.” New York Times, March 12, 1986, A5. Hiatt, Fred. “Governors wary of Sending Guard Troops to Honduras.” Washington Post, April 5, 1986, A1. Toner, Robin. “They Who Beg to Differ on Aid to Nicaragua.” New York Times, March 14, 1986, A14. “U.S. Bars an Oxfam Shipment of Farm Tools to Nicaragua.” New York Times, Sept. 4, 1986, A25. “Foreign Volunteers Ordered to Quit Nicaraguan War Zones–Move Follows Contra Attacks on West European Workers,” Washington Post, Sept. 21, 1986, A21. “War Medals Returned to Protest U.S. Policy.” New York Times, Oct. 10, 1986, A22. Franklin, Ben A. “Polyglot Protest Planned Today.” New York Times, Oct. 25, 1986, 1. Pressley, Sue Ann. “2,000 March Here in Protest of U.S. Policies.” Washington Post, Oct. 26, 1986, A27. Schneider, Keith. “Pattern Seen in Break-Ins at Latin Policy Group.” New York Times, Dec. 3, 1986. Clendinen, Dudley. “Friends and Foes of Contras Rally at Florida Base.” New York Times, Dec. 14, 1986, 20. Lehrich, Tamar. “Nicaragua Visited to Learn and Help.” New York Times, Jan. 25, 1987, sec. 13, A10. Chavez, Linda. “Nicaragua Is Aided by Sister City Projects.” New York Times, Feb. 1, 1987, E6. Franklin, Ben A. “Contra Aid Protesters Found Guilty.” New York Times, Feb. 16, 1987, 9. Wald, Matthew L. “Amy Carter Tells Court She Sat in Road to Alter C.I.A. Policy.” New York Times, April 14, 1987, A17. Wald, Matthew L. “Amy Carter Is Acquitted Over Protest.” New York Times, April 16, 1987, A17. Omang, Joanne. “U.S. Groups Counter Contra Aid With Private ‘Quest for Peace;’ Multimillion-Dollar Effort Includes Medicine, School Supplies.” Washington Post, April 19, 1987, A20. Gaines-Carter, Patrice. “Thousands to Protest U.S. Foreign Policy; Labor, Religious Groups to Converge on City.” Washington Post, April 23, 1987, D5. Hockstader, Lee. “560 Arrested at CIA Headquarters: Throng Protesting U.S. Foreign Policy Snarls Traffic in McLean.” Washington Post, April 28, 1987, A1. Kinzer, Stephen. “American Died in Rebel Ambush, Nicaragua Says.” New York Times, April 30, 1987, 12. Sciolino, Elaine. “U.S. Groups Lay Blame for Killing of Volunteer on Administration.” New York Times, April 30, 1987, A12. Branigin, William. “Americans in Nicaragua Undeterred by Killing: Linder’s Death Spotlights Volunteer Brigade.” Washington Post, May 3, 1987, A21. Bole, William. “Religious Activists Display ‘Reparations Shipment’ to Nicaragua.” Washington Post, July 18, 1987, G12. Schneider, Keith. “A Liberal Group Makes Waves with Its Contra Lawsuit.” New York Times, July 20, 1987, 16. Hyer, Marjorie. “Church Groups Lobby Congress – Catholic Social Justice Leaders Urge End to U.S. Aid to Contras in Nicaragua.” Washington Post, Jan. 30, 1988. Boyd, Gerald M. “Bush Debates With Brother Of American Slain by Contras.” New York Times, Aug. 1, 1987, 1. Rosenthal, Andrew, “Campaign Formed Opposing Contras: Political and Religious Groups Seek Funds to Fight Drive by Conservatives.” New York Times, Aug. 14, 1987, 8. Bishop, Katherine. “Protesters, Angered by Injury, Return to Arms Site.” New York Times, Sept. 3, 1987. 22. “R.O.T.C. Building is Stormed over Maiming of a Protester.” New York Times, Sept. 4, 1987, D15. Courtney, Marian. “Three People Who Chose to Work in Nicaragua.” New York Times, Sept. 6, 1987, Sec. 11, p. 10. Courtney, Marian. “New Jersey Group Seeks Answers in Nicaragua.” New York Times, Sept. 6, 1987, sec. 11, p. 1. “Maimed Protester, 46, Vows He Will Continue.” New York Times, Sept. 12, 1987, 7. Shenon, Philip. “F.B.I. Faces Review over Surveillance of Foes of Policy: President Concerned, He Orders an Internal Inquiry into Watch Put on Critics of the Administration.” New York Times, Jan. 30, 1988, 1. “F.B.I. Director Defends Spying on Political Groups.” New York Times, Jan. 31, 1988, 29. Johnson, Julie. “Opponents of Aid to Contras to Start Broadcast Campaign.” New York Times, Jan. 31, 1988, 16. King, Wayne. “F.B.I. Stand Is Contradicted On Surveillance of Policy Foes.” New York Times, Feb. 14, 1988, 34. “American Volunteer Is Seized by the Nicaraguan Guerrillas.” New York Times, Mar. 5, 1988, 3. Kinzer, Stephen. “Contras Say They’ll Free Captured American.” New York Times, Mar. 10, 1988, A5. “Reagan Action in Honduras Stirs Demonstrations in U.S.” New York Times, Mar. 19, 1988, 20. Applebome, Peter. “Aid Convoy Is Turned Back at Border.” New York Times, June 16, 1988, A8. “Police Seize Eight in Convoy Carrying Aid to Nicaraguans.” New York Times, July 10, 1988, 20. “Convoy Member is Arrested.” New York Times, July 12, 1988, 14. “Supply Convoy to Nicaragua Crosses Border.” New York Times, July 16, 1988, 6. “Convoy Delivers Supplies.” New York Times, July 30, 1988, 6. Shenon, Philip. “F.B.I. Word Due on Penalty In Surveillance of Policy Foes.” New York Times, Sept. 13, 1988. A22. Shenon, Philip. “F.B.I. Chief Disciplines Six For Surveillance Activities.” New York Times, Sept. 15, 1988, A20. Shenon, Philip. “F.B.I. Is Willing to Erase Names From Its Records: Chief Restricts Access to Data on Reagan Foes.” New York Times, Sept. 17, 1988, 5. Belkin, Lisa. “Judge Rebuffs U.S. for Blocking Convoy of Aid to Nicaragua.” New York Times, Oct. 1, 1988, 54. Priest, Dana, and Steve Bates. “1,000 Protest Role Of U.S. in El Salvador; 215 Arrested in Blockade at Pentagon.” Washington Post, Oct. 18, 1988, B1. “200 Arrested near Pentagon in Protest of Salvador Policy.” New York Times, Oct. 18, 1988, A8. “Dukakis Loses Appeal on National Guard.” Washington Post, Oct. 26, 1988, A14. Luther, Sara Fletcher. “At Managua Embassy, Contra War Protested.” New York Times, (letter). Feb. 23, 1989, A22. “1,200 Hold Rally in New York against U.S. Role in Salvador.” New York Times, March 19, 1989, 3. Duggan, Paul. “D.C. Demonstrators Protest El Salvador Election.” Washington Post, Mar 20, 1989, A27. Brozan, Nadine. “160 Demonstrators Are Arrested in U.S. for Salvador Sit-Ins.” New York Times, March 21, 1989, 8. “150 Arrested In Protests Over Aid to El Salvador.” Washington Post, March 21, 1989; A5. Barker, Karlyn. “Refugee’s Arrest at D.C. Church Incites Protests.” Washington Post, March 29, 1989; B07. “The CISPES Investigation (Cont’d. ).” Washington Post, July 18, 1989; A22. Harris, John F. “Hundreds Protest Aid to El Salvador; 95 Arrested at Rally Near White House.” Washington Post, Nov. 19, 1989; C1. Of the hundreds of books and thousands of articles that have been written about the Central America wars of the 1980s, only those that address Central America activism in one form or another are included below. For authors with multiple, similar studies, only the latest or most comprehensive is noted. Amanda Collective. Revolutionary Forgiveness: Feminist Reflections on Nicaragua. Maryknoll, NY: Orbis Books, 1987. Stories of thirteen U.S. Christian women who participated in various solidarity activities in Nicaragua. Arnson, Cynthia J. and Philip Brenner, “The Limits of Lobbying: Interest Groups, Congress, and Aid to the Contras.” In Richard Sobel, ed., Public Opinion and U.S. Foreign Policy: The Controversy over Contra Aid. Lantham, MD: Rowman and Littlefield, 1993. Discusses pro- and anti-Contra aid groups in the battle over Contra aid in Washington in 1985-86, and assesses their overall influence. Atlee-Loudon, Jennifer. Red Thread: A Spiritual Journal of Accompaniment, Trauma and Healing. Washington, DC: EPICA Task Force, 2001. A long-term Witness for Peace volunteer in Nicaragua recounts her experiences and asks soul searching questions. Barns, Bob. Nicaragua Notes: A Collection of Newsletters from a Peace Activist. Nevada City, NV: Friendship Press, 1987. Bob Barns lived and worked in the war zones of Nicaragua for eight and a half months in 1986. Battista, Andrew. “Unions and Cold War Foreign Policy in the 1980s: The National Labor Committee, the AFL-CIO, and Central America,” Diplomatic History, Vol. 26, No. 3 (Summer 2002): 419-451. Examines the role of the National Labor Committee in Support of Democracy and Human Rights in El Salvador. Bau, Ignatius. This Ground is Holy: Church Sanctuary and Central American Refugees. Mahwah, NJ: Paulist Press, 1985. Becker, Mark. “Walking Through the New Nicaragua: Thoughts, journal entries, and other writings from a term with Witness for Peace in Nicaragua.” Peace Studies Internship paper, Peace Studies Dept., Bethel College, August 1986. Online: http://www.yachana.org/reports/nicawfp. Journal reflections during his Witness for Peace tour in 1985-86 and subsequent activities. Becker, William. “The Home Front.” Online: http://www.williamgbecker.com/HomeFront.php. A collection of photographs and descriptions of Central America protests and activities in the Los Angeles area during the mid-1980s. _____. “Nicaragua Election 1990.” Online: http://www.williamgbecker.com/nicaragua_1990.php. William Becker’s journal account of his trip to Nicaragua as an election observer, with accompanying photographs. Bickel, Beverly, and Philip Brenner and William LeoGrande. Challenging the Reagan Doctrine: A Summation of the April 25th Mobilization. Washington, D.C.: The Foreign Policy Education Fund, October 1987. A rare scholarly critique of the planning and implementation of the largest Central America demonstration during the 1980s (April 25, 1987). Brentlinger, John. The Best of What We Are: Reflections on the Nicaraguan Revolution. Amherst: Univ. of Massachusetts Press, 1995. Personal account by an U.S. citizen living in Sandinista Nicaragua. Brett, Edward T. “The Attempts of Grassroots Religious Groups to Change U.S. Policy toward Central America: Their Methods, Successes, and Failures.” Journal of Church and State, vol. 36, no. 4 (August 1991): 773-794. Describes the activities of fifteen U.S. religious organizations involved in Central America activism. _____. The U.S. Catholic Press on Central America: From Cold War Anticommunism to Social Justice. Notre Dame, IN: Univ. of Notre Dame Press, 2003. Brody, Reed. Contra Terror in Nicaragua: Report of a Fact-finding Mission: September 1984-January 1985. Boston: South End Press, 1985. Butigan, Ken. “The Pledge of Resistance: Lessons from a Movement of Solidarity and Nonviolent Direct Action.” In Marc Pilisuk and Michael N. Nagler, Peace Movements Worldwide: Players and Practices in Resistance to War. Santa Barbara, CA: Praeger, 2011: 231-42. The former national Pledge coordinator discusses the development of the Pledge campaign and its significance as a nonviolent social change movement. Butler, Judy. “On the Solidarity Trail.” Envío 74 (Aug. 1987), http://www.envio.org.ni/articulo/3207. An engaging and witty critique of the Central America movement by a veteran activist on a speaking tour through the U.S. during the month of April 1987. Central America Resource Center. Directory of Central America Organizations, Third Edition 1987. Central America Resource Center: Austin, TX, 1986. Comprehensive directory of 1,075 organizations working on Central America campaigns. Chilsen, Liz, and Sheldon Rampton. Friends in Deed: The Story of U.S.-Nicaragua Sister Cities. Madison, WI: Wisconsin Coordinating Council on Nicaragua, 1988. Relates the development of U.S.-Nicaragua sister cities from the U.S. side, describing their purpose, origin, and activities; offers advice on how to start one. Chinchilla, Norma Stoltz, and Nora Hamilton and James Loucky. “The Sanctuary Movement and Central American Activism in Los Angeles.” Latin American Perspectives, Vol. 36, No. 6, SOLIDARITY (November 2009): 101-126. Clark, Jeanne. “Prophetic Rhetoric and the Sanctuary Movement.” PhD dissertation. Univ. of Arizona, 1988. Cohen, Joshua, and Joel Rogers. Rules of the Game: American Politics and the Central America movement. Boston: South End Press, 1986. Examines the Central America movement in the context of progressive social change organizing. Cortright, David. Peace Works: The Citizen’s Role in Ending the Cold War. Boulder, CO: Westview Press, 1993. Recognizes the contribution of the Central America movement to the larger peace movement of the 1980s. Coutin, Susan. “The Culture of Protest: Religious Activism and the U.S. Sanctuary Movement.” PhD dissertation. Stanford Univ., 1990. Crittenden, Ann. Sanctuary: A Story of American Conscience and Law. New York: Weidenfeld & Nicholson, 1988. Cunningham, Hilary. God and Caesar at the Rio Grande: Sanctuary and the Politics of Religion. Minneapolis: Univ. of Minnesota Press, 1995. Davidson, Miriam. Convictions of the Heart: Jim Corbett and the Sanctuary Movement. Tucson: Univ. of Arizona Press, 1988. Dean, Paul Thomas. “Unusual Campaign: NGO’s Long Battle to End Contra Aid.” PhD dissertation. Washington State Univ., May 2011. Recounts the congressional battle over Contra aid, utilizing the papers of Rep. David Bonior (Wayne State Univ.) and describes the efforts of nongovernmental organizations in the Countdown ‘87 lobbying campaign. Dixon, Marlene, ed. On Trial, Reagan’s War Against Nicaragua: Testimony of the Permanent People’s Tribunal. San Francisco: Synthesis Publications, 1985. Documents testimony of U.S. and Nicaraguan intellectuals and activists at a meeting in Brussels, Belgium, Oct.7-9, 1984. Dunbar-Ortiz, Roxanne. Blood on the Border: A Memoir of the Contra War. Cambridge, MA: South End Press, 2003. A personal account of her experiences and meetings with numerous parties in Nicaragua. Early, Alexandra, and Jan Morrill. “Sister Cityhood is Powerful Learning From Twenty-Five Years of Solidarity, Struggle, & Tortilla-Making in El Salvador,” Social Policy 41, 2 (Summer 2011): 36. The writers are associated with the U.S.-El Salvador Sister Cities Network, which represents seventeen pairings. • Green, Diane. “The CISPES Solidarity Model.” Critique of the Committee in Support of the People of El Salvador (CISPES). • Gosse, Van. “Radical, Pragmatic, and Successful.” Critique of CISPES. • Meyer, Julie. “Breaking Many Taboos.” Women’s roles and struggles in the El Salvador solidarity movement. • Magara, Aquiles. “The Heart, Soul, and Engine.” Salvadorans in the U.S. and their role in the solidarity activism. • Swedish, Margaret. “The Religious Roots of Solidarity.” The breadth and depth of faith-based solidarity work. • Kenney, Kathleen. “Physical Solidarity.” Religious accompaniment activities in El Salvador. • Wheaton, Philip. “Sanctuary: People Before the Law.” Sanctuary activities in the U.S.
• Dyson, David. “Labor Takes the Field.” Role of labor unions in the Central America movement. • Zielinski, Mike. “Solidarity Without Borders.” State of solidarity as of 1994. Envío team. “Internationalist Caught in War.” Envío 60 (June 1986), http://www.envio.org.ni/articulo/3507. The Jesuit editors of this Nicaraguan journal discuss the dedication and sacrifice of internationalists aiding Sandinista Nicaragua. Everett, Melissa. Bearing Witness, Building Bridges: Interviews with North Americans Living & Working in Nicaragua. Philadelphia, PA: New Society Publishers, 1986. Forward by Congressman Bruce Morrison. Interviews with seventeen North Americans committed to helping the Nicaraguan people. _____. Breaking Ranks. Philadephia: New Society Publishers, 1989. Chapters focus on key critics of the Reagan administration and participants in the Central America Movement, including veterans Jerry Genesio and Charlie Liteky, and CIA agents Ralph McGehee and David MacMichael. Falcoff, Mark. “Revolutionary Tourism.” Public Opinion 9 (Summer 1986): 6-8. Jaundiced view from the right of Americans traveling to Central America. Fisher, Steve. “The Nicaraguan Revolution and the U. S. Response: Lessons for Appalachia.” Appalachian Journal, Vol. 14, No. 1 (Fall 1986): 22-37. Critiques U.S. foreign policy and draws a parallel between the Sandinista Revolution and efforts to improve the Appalachia region of the U.S.
Gelbspan, Ross. Break-Ins, Death Threats, and the FBI: The Covert War against the Central American Movement. Boston: South End Press, 1991. Describes FBI harassment of Central America activist groups. Genesio, Jerry. Veterans for Peace: The First Decade (Falmouth, ME: Jerry Genesio, 1997). Recounts the establishment of Veterans for Peace in 1985 and the activities of military veterans. Gettleman, Marvin E., and Patrick Lacefield, Louis Menashe, David Mermelstein, and Ronald Radosh, eds. El Salvador: Central America in the Cold War. New York: Grove Press, 1981. An early intellectual contribution to fostering a critical public discourse on El Salvador. Glick, Brian. War at Home: Covert Action against U.S. Activists and What We Can Do About It. Boston: South End Press, 1989. Investigates government spying on Central America activists. Golden, Renny, and Michael McConnell. Sanctuary: The New Underground Railroad. Maryknoll, NY: Orbis Books, 1986. Goodfriend, Hilary. “A Demand for Sanctuary,” Jacobin, February 17, 2017, online: https://www.jacobinmag.com/2017/02/sanctuary-movement-central-america-el-salvador-trump-deportations. Reviews the Sanctuary Movement in light of the Trump administration’s immigration proposals. Gosse, Van. “Active Engagement: The Legacy of Nicaragua Solidarity.” NACLA Report on the Americas, March-April 1995. The historian-activist Van Gosse discusses the contributions of leftist, religious, and peace sectors to the Central America movement and sees a growing maturity on the part of the left in opting for pluralism over sectarianism. Download scanned article from http://www.vangosse.com/scholarly-writing.html. _____. “‘El Salvador is Spanish for Vietnam’: A New Immigrant Left and the Politics of Solidarity.” In Paul Buhle and Dan Georgakas, eds., The Immigrant Left in the United States. Albany: State University of New York, 1996: 302-30. Download scanned article from http://www.vangosse.com/scholarly-writing.html. _____. “’The North American Front’: Central American Solidarity in the Reagan Era.” In Michael Sprinker and Mike Davis, eds., The Year Left, Vol. 3: Reshaping the U.S. Left: Popular Struggles in the 1980s. New York: Verso, 1988. Download scanned article from http://www.vangosse.com/scholarly-writing.html. _____. “Review of Resisting Reagan: The U.S. Central America Peace Movement by Christian Smith.” Peace and Change 23, 1 (January 1998): 103-106. Gosse criticizes the omission of leftist groups from Christian Smith’s analysis of the Central America movement. Griffin-Nolan, Ed. Witness for Peace: A Story of Resistance. Louisville, KY: Westminster/John Knox Press, 1991. An engaging account of the origins and activities of Witness for Peace by the former WFP media coordinator in Nicaragua. Hamilton, Nora, and Norma Stoltz Chinchilla. Seeking Community in a Global City. Philadelphia: Temple Univ. Press, 2001. Examines the struggles of Salvadoran and Guatemalan refugees arriving in Los Angeles during the 1980s. Hannon, James. “Identity and Participation in a Social Movement Organization: The Boston-Area Pledge of Resistance.” PhD dissertation, 1991. As a “participant observer,” Hannon examines the nonviolent activist sub-culture that permeated the Boston Pledge of Resistance. Hegg, Manuel Ortega, and Günther Maihold. La Cooperación Intermunicipal e Intercomunal y Los Hermanamientos de Ciudades en Nicaragua 1980-1990. Managua: Friedrich Ebert Stiftung, 1991. The authors discuss and analyze the rise of Nicaraguan sister cities, first with Europeans then with North Americans, and provide insight into motivations and attitudes on the Nicaraguan side. Hildreth, Anne Marie. “Collective Action, Individual Incentives, and Political Identity: The Sanctuary Movement.” PhD dissertation. Univ. of Iowa, 1989. Hoyt, Katherine. 30 Years of Memories: Dictatorship, Revolution, and Nicaragua Solidarity. Washington, DC: Nicaragua Network Education Fund, 1996. A moving account of her life in Nicaragua until 1983 and her subsequent work with anti-intervention groups in the U.S.
Inter-religious Task Force on Central America (IRTFCA). Peacemaking II: U.S. Religious Statements on Central America. New York: IRTFCA, July 1984. Statements of over twenty mainline religious denominations and ecumenical organizations against U.S. policies toward Central America. Jones, Jeff, ed. Brigadista: Harvest and War in Nicaragua: Eyewitness Accounts of North American Volunteers Working in Nicaragua. New York: Praeger, 1986. Stories of more than sixty people who participated in solidarity brigades and other activities in Nicaragua. Kavaloski, Vincent C. “Transnational Citizen Peacemaking as Nonviolent Action,” Peace and Change 15 (April 1990): 173–194. Describes how U.S. sister city pairings with both Nicaraguan and Soviet cities served “to undermine ‘enemy images’ and thus to help build a global peace culture beyond the often adversarial nation-state system” (174). Koll, Karla Ann. “Presbyterians, the United States, and Central America: Background of the 1980s Debate.” The Journal of Presbyterian History, Vol. 78, No. 1 (Spring 2000): 87-102. Kruckewitt, Joan. The Death of Ben Linder: The Story of a North American in Sandinista Nicaragua. New York: Seven Stories Press, 1999. Kruckewitt captures the chaos and excitement of Sandinista Nicaragua, and the tragedy of Ben Linder‘s death. Leahy, Margaret. “The Harassment of Nicaraguanists and Fellow-Travelers.” In Thomas Walker, ed., Reagan Versus the Sandinistas: The Undeclared War on Nicaragua. Boulder, CO: Westview Press, 1987. LeoGrande, William M. Our Own Backyard: The United States in Central America, 1977-1992. Chapel Hill: Univ. of North Carolina Press, 1998. A comprehensive and thorough review of Congressional debates and diplomacy related to Central America, although it says little about grassroots activism. Lorentzen, Robin. Women in the Sanctuary Movement. Philadelphia: Temple Univ. Press, 1991. MacEoin, Gary, ed. Sanctuary: A Resource Guide for Understanding and Participating in the Central American Refugees’ Struggle. San Francisco: Harper and Row, 1985. McCarger, James. El Salvador and Nicaragua: The AFL-CIO Views on the Controversy. Washington, D.C.: AFL-CIO, 1985. McDaniel, Judith. Sanctuary: A Journey. Ithaca, NY: Firebrand Books, 1986. McGinnis, J. Solidarity with the People of Nicaragua. New York: Orbis Books, 1985. McGinnis describes numerous solidarity projects and their benefits to the Nicaraguan people. Membreño Idiáquez, Marcos. “Whither Solidarity with Nicaragua?” Envío. No. 189, April 1997. A Nicaraguan view of international solidarity activities. Menard-Warwick, Julia, and Peter Menard-Warwick. Letters Home: A Year in Nicaragua. Enterprise, OR: Pika Press, 1989. Moreno, Dario. “Thunder on the Left: Radical Critiques of U.S. Central America Policy” (review of six books). Latin American Research Review, Vol. 26, No. 3 (1991): 226-34. Mosley, Don, and Joyce Hollyday. With Our Own Eyes: The dramatic story of a Christian response to the wounds of war, racism, and oppression. Scottdale, PA: Herald Press, 1996. Mosley discusses his spiritual motivation and practical efforts to aid the Nicaraguan people through a new “Walk in Peace” program, which provided Nicaraguans maimed by Contra landmines with artificial limbs. National Security Archive. See Iran-Contra collection and Nicaragua collection for documents that show how Reagan administration agencies and officials viewed the Central America movement. Nepstad, Sharon Erickson. Convictions of the Soul: Religion, Culture, and Agency in the Central America Solidarity Movement. New York: Oxford Univ. Press, 2004. Nepstad examines the culture of religious solidarity in the U.S. through a sociological lens, describing how activists were emotionally moved by the human suffering they encountered in Central America, by the “martyr stories” they shared, and by the anger evoked from “President Reagan’s misrepresentation of Central America” (121). _____. “Creating Transnational Solidarity: The Use of Narrative in the U.S.-Central American Peace Movement,” Mobilization: An International Quarterly 6, 1 (Spring 2001): 21-36; reprinted in Jackie Smith and Hank Johnston, eds., Globalization and Resistance: Transnational Dimensions of Social Movements. Lanham, MD: Rowman & Littlefield, 2002: 133-49. _____. “Nicaragua Libre: High-Risk Activism in the U.S.-Nicaragua Solidarity Movement.” PhD dissertation. Univ. of Colorado, Boulder, 1996. Nepstad interviews American “brigadistas” who aided Nicaraguan coffee harvests, exploring their personal and ideological motivations. Otter, Elma L., and Dorothy F. Pine. The Sanctuary Experience: Voices of the Community. San Diego: Aventine Press, 2004. Ovryn, Rivera, Rachel. “A Question of Conscience: The Emergence and Development of the Sanctuary Movement in the United States.” PhD dissertation, City Univ. of New York, 1987. Peace, Roger. A Call to Conscience: The Anti-Contra War Campaign. Amherst: Univ. of Massachusetts Press, June 2012. A comprehensive history of the anti–Contra War campaign and its Nicaragua connections from 1982 to 1990. Analyzes competing frames and arguments of the Reagan administration and the anti-Contra War campaign, the decentralized structure of the campaign, official U. S. and Nicaraguan perspectives on international solidarity, and the Nicaraguan governmental structure for managing solidarity activities. The study includes case studies of local organizing initiatives and short biographies of U.S. and Nicaraguan participants. Perla, Héctor. “Sí Nicaragua Venció, El Salvador Vencerá: Central American Agency in the Creation of the U.S.-Central American Peace and Solidarity Movement.” Latin American Research Review 43, 2 (2008): 107-35. Perla takes issue with the exclusion of Central American actors in the works of sociologists Sharon Nepstad and Christian Smith. He argues that “much of the growth and success of the CAPSM [Central America Peace and Solidarity Movement] is attributable to the Central American revolutionaries’ efforts” (138-39), although his definition of revolutionaries is quite broad. Porpora, Douglas V. How Holocausts Happen: The U.S. in Central America. Philadelphia: Temple Univ. Press, 1990. Porpora examines how “publics are lulled into acceptance of murderous policies” (12) in both Nazi Germany and the U.S. (related to U.S. intervention in Central America). He cites “the weakness of the American will to truth” (179) and outlines steps to counter this, but gives only faint recognition to the efforts of the Central America movement in this direction. Ramírez, Sergio. “U.S. Working People Can Stop Intervention in Central America” (March 4, 1982). In Nicaragua: The Sandinista People’s Revolution: Speeches by Sandinista Leaders (New York: Pathfinder Press, 1985). Rampton, Sheldon. “Central America Activism: Getting Personal.” In John Tirman, ed., Annual Review of Peace Activism (Boston: Winston Foundation for World Peace, 1989): 52-58. Reuben, Debra, and Sylvia Sherman. “Ten Years of Solidarity: A Nicaragua Network History.” Nicaraguan Perspectives, No. 17 (Summer/Fall 1989): 6-9, 51. Ridenour, Ron. Yankee Sandinistas: Interviews with North Americans Living & Working in the New Nicaragua. Willimantic, CT: Curbstone Press, 1986. Ridenour interviews nine U.S. citizens working to support the Sandinista social transformation in Nicaragua, probing their motives and discussing their experiences. Roberts, Donovan. Stubborn ounces–just scales: With Witness for Peace in Nicaragua: a gringo’s reflections, observations, and sermons. Lima, Ohio: Fairway Press, 1991. Ryan, Charlotte. “Framing a Message: Nicaragua Comes to New Bedford.” In John Tirman, ed., Annual Review of Peace Activism (Boston: Winston Foundation for World Peace, 1989): 47-51. Examines how a Nicaragua sister city program in New Bedford, MA, framed its educational messages and managed its local media relations. _____. Prime Time Activism. Boston, MA: South End Press, 1991. Ryan expands on the above work, positing lessons useful to activists and elaborating on social movement organization (sociological) theories. Sampson, Cynthia, and John Paul Lederach. From the Ground Up: Mennonite Contributions to International Peacebuilding. New York: Oxford Univ. Press, 2000. The authors describe their experiences in assisting peace mediation projects in Honduras and Nicaragua in the late 1980s. Scallen, Pat. “The Other Americans: U.S. Solidarity Workers in Sandinista Nicaragua.” MA thesis, Tulane Univ., 1992. Interviews Americans living and working in Nicaragua, providing insights into their lives and motivations. Well-written. Secrest, Donald, and Gregory G. Brunk and Howard Tamashiro. “Moral Justifications for Resort to War with Nicaragua: The Attitudes of Three American Elite Groups.” The Western Political Quarterly 44, 3 (Sept. 1991): 541-59. Smith, Christian. Resisting Reagan: The U.S. Central America Peace Movement. University of Chicago Press, 1996. This is the only book-length study of the Central America movement as a whole. Smith, a sociologist, examines the moral outrage of activists, protest and lobbying activities, competing frames of public discourse, governmental harassment, and internal movement struggles. He focuses on a few religious-based groups — Sanctuary groups, Witness for Peace, and the Pledge of Resistance — and argues that “religion served as a primary factor in the negotiation of the movement’s collective identity” (380). Smith takes a critical view of leftist groups, when mentioned, despite the increasing cooperation between religious and secular left sectors, facilitated in part by liberation theology. “Statement of Adm. Stansfield Turner, Former Director of Central Intelligence,” April 16, 1985. In U.S. Support for the Contras, Hearing Before the Subcommittee on Western Hemisphere Affairs of the Committee on Foreign Affairs, House of Representatives, Ninety-Ninth Congress, First Session, April 16, 17 and 18, 1985 (Washington, DC: U.S. Government Printing Office, 1985): 4. Adm. Turner testified at the hearing, “I believe it is irrefutable that a number of the Contras’ actions have to be characterized as terrorism, as State-supported terrorism.” Although not intended to help anti-Contra groups, it validated their documentation of Contra attacks. Stout, Angela. “Sanctuary in the 1980s: The Dialectics of Law and Social Movement Development.” PhD dissertation. Univ. of Delaware, 1989. Surbrug, Robert. Beyond Vietnam: The Politics of Protest in Massachusetts, 1974-1990. Amherst: Univ. of Massachusetts Press, 2009. Surbrug places the Central America movement in Massachusetts in the historical context of previous and co-existing movements: the anti-Vietnam War movement, anti-nuclear power movement, and Nuclear Weapons Freeze Campaign. He argues that the overall effect of these movements was to cultivate and reinforce a liberal-left political consciousness in the state. Swedish, Margaret, and Marie Dennis. Like Grains of Wheat: A Spirituality of Solidarity. Maryknoll, NY: Orbis Books, 2004. Swedish, the founder of the Religious Task Force on Central America, and Marie Dennis, the director of the Maryknoll Office of Global Concerns, employ religious rather than sociological language in examining the faith-based solidarity movement they helped to create, writing that Central America solidarity is not “just a political project intent on changing government policies,” but “a sign of God’s redemptive healing action in our human history” (213). As with studies by Nepstad, the authors focus only on the U.S. side of the solidarity relationship. Tomsho, Robert. The American Sanctuary Movement. Austin: Texas Monthly Press, 1987. United States, Congress. House Committee on Armed Services. Subcommittee on Investigations. Concord Naval Weapons Station train incident: Hearing before the Investigations Subcommittee of the Committee on Armed Services, House of Representatives, One Hundredth Congress, first session, November 18, 1987. Washington, DC: Government Printing Office, 1988. Official investigation of the tragic incident in which S. Brian Willson lost both his legs. _____. House Subcommittee on Civil and Constitutional Rights of the Committee on the Judiciary: Hearings, 1987. Break-Ins at Sanctuary Churches and Organizations Opposed to Administration Policy in Central America. Washington, DC: Government Printing Office, 1987. _____. House Subcommittee on Civil and Constitutional Rights of the Committee on the Judiciary: Hearings, 1988. CISPES and FBI Counter-Terrorism Investigations. Washington, DC: Government Printing Office, 1988. _____. House Committee on Foreign Affairs. Subcommittee on Western Hemisphere Affairs. United States volunteers in Nicaragua and the death of Benjamin Linder: Hearing before the Subcommittee on Western Hemisphere Affairs of the Committee on Foreign Affairs, House of Representatives, One hundredth Congress, first session, May 13, 1987. Washington: Government Printing Office, 1987. This one-day hearing contains testimony from Ben Linder’s parents and Bishop Thomas Gumbleton, on the one hand, and administration spokesperson Elliott Abrams, on the other. United States Senate. Select Committee on Intelligence. The FBI and CISPES: Report of the Select Committee on Intelligence, July 14, 1989. Washington, DC: Government Printing Office, 1989. Weber, Clare Marie. Visions of Solidarity: U.S. Peace Activists in Nicaragua from War to Women’s Activism and Globalization. Lanham, MD: Lexington Books, 2006. Examines the transition from anti-Contra War activism to economic and women’s issues in two key groups, Witness for Peace and the Wisconsin Coordinating Council on Nicaragua. Criticizes the alleged failure of Witness for Peace to combat racial discrimination and economic exploitation in the U.S.
_____. “Women to Women: Dissident Citizen Diplomacy in Nicaragua.” In Nancy A. Naples and Manisha Desai, eds., Women‘s Activism and Globalization: Linking Local Struggles and Transnational Politics (New York: Routledge, 2002): 45-64. Webre, Stephen. “Central America and the United States in the 1980s: Recent Descriptions and Prescriptions” (review of seven books), Latin American Research Review, Vol. 21, No. 3 (1986): 179-91. Williams, Virginia S. “Grassroots Movements and Witnesses for Peace: Challenging U.S. Policies in Latin America in the Post-Cold War Era.” Peace & Change 29, 3-4 (July 2004): 419-430. Examines the continuity of the “U.S.-Latin American peace movement” from the end of the Cold War until 2004. Wiltfang, Gregory L., and Doug McAdam. “The Costs and Risks of Social Activism: A Study of Sanctuary Movement Activism.” Social Forces, Vol. 69, No. 4 (Jun., 1991): 987-1010. Witham, Nick. The Cultural Left and the Reagan Era: U.S. Protests and the Central American Revolutions. London: I. B. Tauris, 2015. 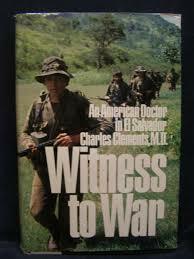 • Bitter Witness: Nicaraguans and the Covert War, a Chronology and Several Narratives (1984), 172 pages. • The Story of Felipe y Mery Barreda of Esteli (1984), 28 pages. • Kidnapped by the Contras: The Peace Flotilla on the Rio San Juan, Nicaragua (August 1985), 48 pages. • What We Have Seen and Heard: The Effects of the Contra War against Nicaragua (1985), 16 pages. • What We Have Seen and Heard in Nicaragua: Witness for Peace on-the-scene Reports (1987), 16 pages. • Nicaragua: Civilian Victims of the U.S. Contra War, July 1986-January 1987 (February 1987), 44 pages. • “Slender Wooden Crosses: The War Continues in Nicaragua” (24 minute video). Durham, NC: Witness for Peace, 1989.